YSL Chromatic Eyeshadow Palette- I bought it 2 years ago with a discount coupon from Sephora. It is regardes as a prestigious brand- something I wouldn’t be able to to splurge on a day-to-day basis. If you just observe from its appearance, it seem very normal- just any brown/earthy tone eye shadows you can find anywhere. The magic begins when you dab a little of water on it, the pigment became more pronounced and gives you the “wet” eyes effect. 1. Use #1 the lightest colour on the top right corner and apply all over your eyelids- it’s the wash of colour that we must have as our base, to even out the skin tone on our lids. 2. Use #2 (top left) and dab it on the corners of eyes, to create a subtle depth on the corner. 3. #3 (bottom left) is applied on the opposite corner of your eyes so your eyes “pop” more with the bright shimmers. p.s. 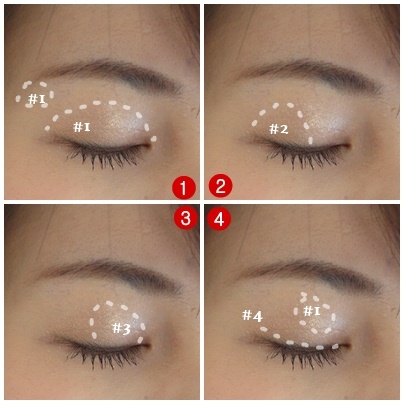 the last mini-step is to use #1 (top right) again and dab it on the centre of your eyelid so it creates a more “3D” effect- your eyes stand out more and is more defined. The finish is amazing! It reflect differently under each lighting. Whether it’s a yellow-y light or white lighting, the colour and the sheen adapt very well in different environment- and that’s what I want- Looking beautiful no matter how the light treats us!